Sweet and nutty with a hint of orange this biscotti is the perfect accompaniment to my morning coffee. 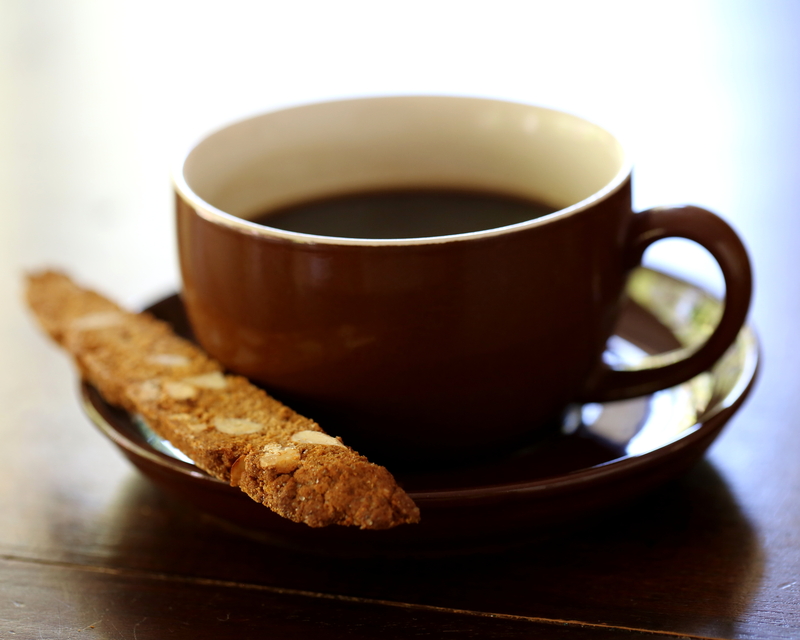 Coffee with biscotti is, for me, a small compensation for the fact that it’s morning and I am awake. It’s not that I don’t like mornings, I just wish they weren’t so early in the day! My morning caffeine fix has always been important to me (and to those who live with me) but it has become more important in recent years. My son turned three this week and I could probably count on one hand the number of times he has slept through the night. So in the absence of adequate sleep I have come to rely on caffeine to get me through the day. I do love coffee, but oh how I miss sleep! 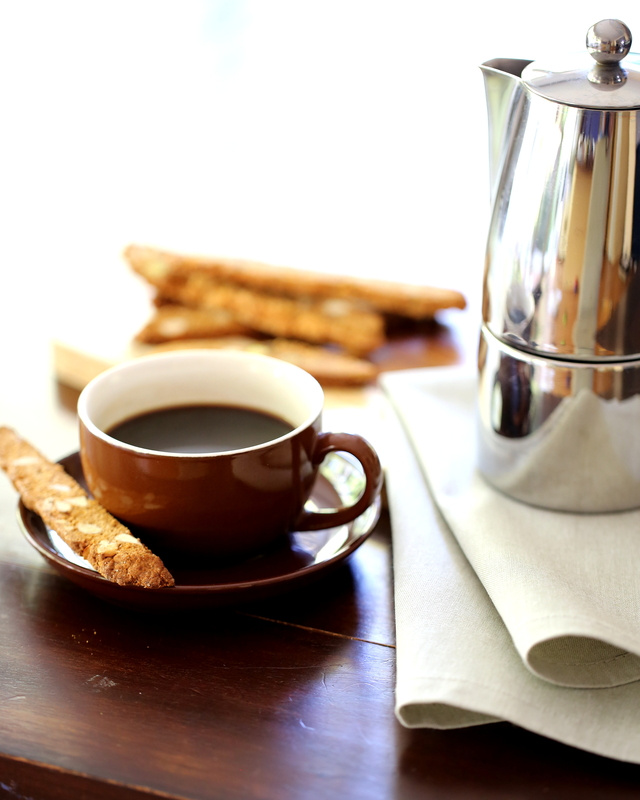 Even if you don’t drink coffee you can still enjoy biscotti. It works well with any hot drink, as a layered dessert with liqueur/cream/fruit or even simply crumbled over ice-cream. This biscotti recipe is egg and dairy free and vegan bakers could easily substitute the honey with golden syrup. Are you a morning person? Do you enjoy biscotti? What do you have with your morning caffeine fix? Preheat oven to 180C (350F). Line the base of a large rectangular tray with baking paper. Mix together all of the dry ingredients and orange zest in a large bowl. Create a well in the centre and add the remaining ingredients. Mix well. Tip all of the ingredients on to the baking try and form into two logs. Bake for 30 minutes. Remove from the oven and cool for at least ten minutes. Cut into slices, as thin as possible, on the diagonal if you want long elegant pieces, using a serrated knife. Place the slices on a baking tray, with the cut side up, and bake for about 15 minutes. Place on a wire rack to cool. The biscotti will harden as it cools. Posted in Biscuits & Cookies, Sweet TreatsTagged almonds, biscotti, coffee, dairy free, egg free, food, food photography, galliano amaretto, orange, vegan, vegetarianBookmark the permalink. 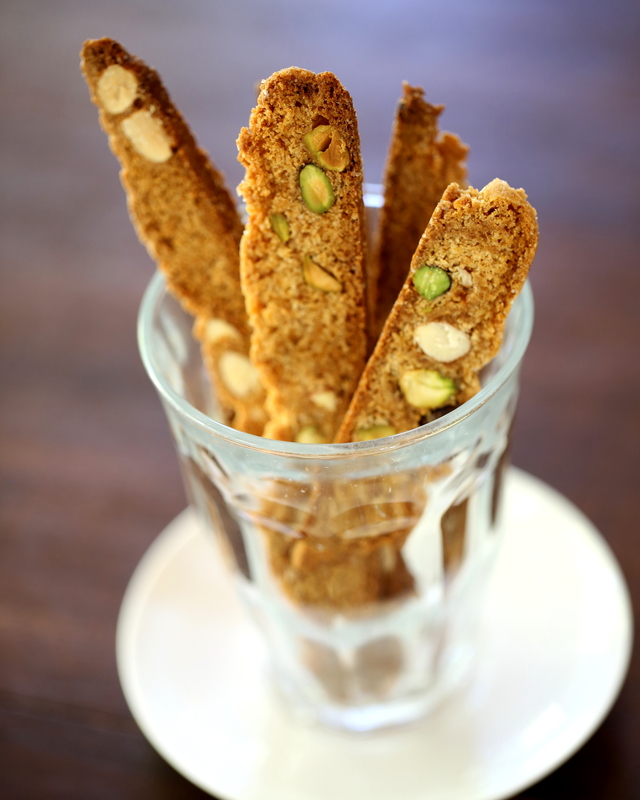 I love the idea of orange and almond together in a biscotti! I usually have coffee cake/breakfast cake or some sort of bread or muffin with my caffeine fix in the morning. This biscotti sounds delicious! Love biscotti. Love coffee! Both great for breakfast! I have an 18 & 15 year old and I can tell that eventually they do sleep through -10.30am Sunday morning….still sleeping! Thank you … I find that reassuring! I love biscotti but never made it. It’s on my list to make. First time on your blog and what a delightful sight. Following.